Previously, I had boot the trivial Multiboot kernel. Despite it was really fun, I need more than just showing a letter on a screen. My goal is to write a simple kernel with Unix-ready userspace. I have been writing my kernel for the last couple of months (on and off) and with help of OSDev wiki I got a quite good kernel based on meaty skeleton and now I want to go further. But where to? My milestone is to make keyboard input working. This will require working interrupts, but it’s not the first thing to do. ‘ESP’ - The OS image must create its own stack as soon as it needs one. ‘GDTR’ - Even though the segment registers are set up as described above, the ‘GDTR’ may be invalid, so the OS image must not load any segment registers (even just reloading the same values!) until it sets up its own ‘GDT’. ‘IDTR’ The OS image must leave interrupts disabled until it sets up its own IDT. # Reserve a stack for the initial thread. Next, we need to setup segmentation. We have to do this before setting up interrupts because each IDT descriptor gate must contain segment selector for destination code segment - a kernel code segment that we must setup. It’s fine for kernel-only mode because it has 32-bit segments for code and data of size 232, but no segments with DPL=3 and also 16-bit code segments that we don’t want. But really it is just plain stupid to rely on undefined values, so we set up segmentation by ourselves. Segmentation is a technique used in x86 CPUs to expand the amount of available memory. There are 2 different segmentation models depending on CPU mode - real-address model and protected model. Real mode is a 16-bit Intel 8086 CPU mode, it’s a mode where processor starts working upon reset. With a 16-bit processor, you may address at most 216 = 64 KiB of memory which even by the times of 1978 was way too small. So Intel decided to extend address space to 1 MiB and made address bus 20 bits wide (220= 1048576 bytes = 1 MiB). But you can’t address 20 bits wide address space with 16-bit registers, you have to expand your registers by 4 bits. This is where segmentation comes in. The idea of segmentation is to organize address space in chunks called segments, where your address from 16-bit register would be an offset in the segment. Note, that with this formula it’s up to you to choose segments size. The only limitation is that segments size is at least 16 bytes, implied by 4 bit shift, and the maximum of 64 KiB implied by Offset size. Note the wrap around part. this is where it starts to be complicated and it’s time to tell the fun story about Gate-A20. On Intel 8086, segment register loading was a slow operation, so some DOS programmers used a wrap-around trick to avoid it and speed up the programs. Placing the code in high addresses of memory (close to 1MiB) and accessing data in lower addresses (I/O buffers) was possible without reloading segment thanks to wrap-around. Now Intel introduces 80286 processor with 24-bit address bus. CPU started in real mode assuming 20-bit address space and then you could switch to protected mode and enjoy all 16 MiB of RAM available for your 24-bit addresses. But nobody forced you to switch to protected mode. You could still use your old programs written for the Real mode. Unfortunately, 80286 processor had a bug - in the Real mode it didn’t zero out 21st address line - A20 line (starting from A0). So the wrap-around trick was not longer working. All those tricky speedy DOS programs were broken! IBM that was selling PC/AT computers with 80286 fixed this bug by inserting logic gate on A20 line between CPU and system bus that can be controlled from software. On reset BIOS enables A20 line to count system memory and then disables it back before passing control to operating CPU, thus enabling wrap-around trick. Yay! Read more shenanigans about A20 here. So, from now on all x86 and x86_64 PCs has this Gate-A20. Enabling it is one of the required things to switch into protected mode. Needless to say that Multiboot compatible bootloader enables it and switching into protected mode before passing control to the kernel. As you might saw in the previous section, segmentation is an awkward and error-prone mechanism for memory organization and protection. Intel had understood it quickly and in 80386 introduced paging - flexible and powerful system for real memory management. Paging is available only in protected mode - successor of the real mode that was introduced in 80286, providing new features in segmentation like segment limit checking, read-only and execute-only segments and 4 privilege levels (CPU rings). Although paging is the mechanism for memory management when operating in protected mode all memory references are subject of segmentation for the sake of backward compatibility. And it drastically differs from segmentation in real mode. In protected mode, instead of segment base, segment register holds a segment selector, a value used to index segments table called Global Descriptor Table (GDT). This selector chooses an entry in GDT called Segment Descriptor. Segment descriptor is an 8 bytes structure that contains the base address of the segment and various fields used for various design choices howsoever exotic they are. GDT is located in memory (on 8 bytes boundary) and pointed by gdtr register. All memory operations either explicitly or implicitly contain segment registers. CPU uses the segment register to fetch segment selector from GDT, finds out that segment base address and add offset from memory operand to it. You can mimic real-mode segmentation model by configuring overlapping segments. And actually, absolutely most of operating systems do this. They setup all segments from 0 to 4 GiB, thus fully overlapping and carry out memory management to paging. First of all, let’s make it clear - there is a lot of stuff. When I was reading Intel System programming manual, my head started hurting. And actually, you don’t need all this stuff because it’s segmentation and you want to set it up so it will just work and prepare the system for paging. This structure not only sane but is also required if you want to use SYSCALL/SYSRET - fast system call mechanism without CPU exception overhead of int 0x80. These 4 segments are “non-system”, as defined by a flag S in segment descriptor. You use such segments for normal code and data, both for kernel and userspace. There are also “system” segments that have special meaning for CPU. Intel CPUs support 6 system descriptors types of which you should have at least one Task-state segment (TSS) for each CPU (core) in the system. TSS is used to implement multi-tasking and I’ll cover it in later articles. Four segments that we set up differs in flags. Code segments are execute/read only, while data segments are read/write. Kernel segments differ from userspace by DPL - descriptor privilege level. Privilege levels form CPU protection rings. Intel CPUs have 4 rings, where 0 is the most privileged and 3 is least privileged. CPU rings is a way to protect privileged code such as operating system kernel from direct access of wild userspace. 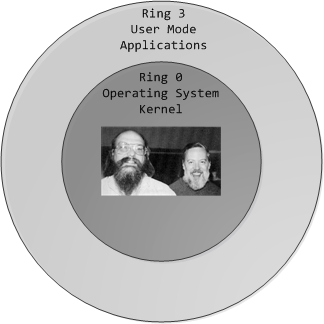 Usually, you create kernel segments in a ring 0 and userspace segments in ring 3. It’s not that it’s impossible to access kernel code from userspace, it is, but there is a well-defined, controlled by the kernel, mechanism involving (among other things) switch from ring 3 to ring 0. Because RPL is under calling software control, it may be used to tamper privileged software. To prevent this CPL is used in access checking. Let’s look how control is transferred between code segments. We will look into the simplest case of control transfer with far jmp/call, Special instructions SYSENTER/SYSEXIT, interrupts/exceptions and task switching is another topic. When you issue far jmp/call CPU takes CPL from CS, RPL from segment selector encoded into far instruction operand and DPL from target segment descriptor that is found by offset from segment selector. Then it performs privilege check. If it was successful, segment selector is loaded into the segment register. From now you’re in a new segment and EIP is an offset in this segment. Called procedure is executed in its own stack. Each privilege level has its own stack. Fourth privilege level stack is pointed by SS and ESP register, while stack for privilege levels 2, 1 and 0 is stored in TSS. Finally, let’s see how it’s all working. If it’s not a control transfer instruction (far jmp/call, SYSENTER/SYSCALL, call gate, TSS or task gate) then go to step 8. If it’s a control transfer instruction then load CPL from CS, RPL from segment selector and DPL from descriptor pointed by segment selector. Perform access check: MAX(CPL,RPL) <= DPL. Otherwise, load segment register with segment selector. Finally, add current segment base address taken from segment register (actually cached value from hidden part of segment register) and offset taken from the logical address (instruction operand), producing the linear address. Note, that without segments switching address translation is pretty straightforward: take the base address and add offset. Segment switching is a real pain, so most operating systems avoids it and set up just 4 segments - minimum amount to please CPU and protect the kernel from userspace. Basically, there is a flat memory model with 4 segments from 0 to 0xfffff * granularity, where granularity flag set to 1 specifies 4096 increments, thus giving us the limit of 4 GiB. Userspace and kernel segments differ in DPL only. Unfortunately, I wasn’t able to track down how userspace was set up (TSS only?). As you can see, userspace code and data segments are at positions 5 and 6 in GDT. I don’t know how SYSENTER/SYSEXIT will work here because you set the value of SYSENTER segment in IA32_SYSENTER_CS MSR. All other segments are calculated as an offset from this MSR, e.g. SYSEXIT target segment is a 16 bytes offset - GDT entry that is after next to SYSENTER segment. In this case, SYSEXIT will hit LDT. Some help from OpenBSD kernel folks will be great here. xv6 is a re-implementation of Dennis Ritchie’s and Ken Thompson’s Unix Version 6 (v6). It’s a small operating system that is taught at MIT. // Map "logical" addresses to virtual addresses using identity map. // an interrupt from CPL=0 to DPL=3. Four segments for kernel and userspace code and data, one for TSS, nice and simple code, clear logic, great OS for education.